The Prince's family have brewed quality beer since 1260, and have been responsible for so much influence on the beers we drink today both inside and outside of Bavaria. The fantastic Oktoberfest began in 1810 as the Bavarian royal family wedding celebration and is now the biggest fair or festival in the world with an incredible 6 million plus revellers. Rather perversely now though, Prince Luitpold's own, Kaltenberg König Ludwig beers have no tent at the festival because the brewery falls outside of the required area. 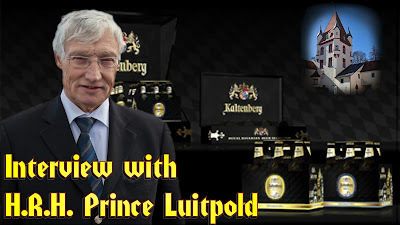 Thwaites brewery has a unique on-going partnership with Prince Luitpold, so look out for more Kaltenberg König Ludwig beers in their pubs soon. They may seem strange bedfellows, but it's a marriage made in beer heaven. As a young boy, I was truly the original Oliver Twist. The holes in my school shoes were not patched inside with the cardboard from Cornflakes boxes like the poor waifs in the movies. Instead, in my ragged shoes, the wet pavement was﻿﻿﻿ held back by the cardboard from cheap supermarket home-brand boxes.